Chris Summers is a new media artist currently residing in Columbus, Ohio. 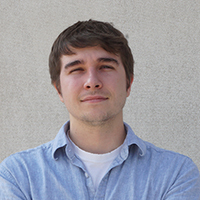 Having a BFA in Art & Technology from The Ohio State University, Chris serves as the Media Manager and the Instructional Technologist in the Department of Dance and ASC Tech at OSU. When not creating artwork, Chris enjoys coffee, being outside with his newfie, playing soccer, and coming up with reasons to have pizza for dinner as often as possible.